1. Combine fenugreek powder, ginger-garlic paste, green chillies, coriander leaves, vinegar and salt together. 2. Marinate the chicken cubes in this mixture and keep it in the fridge for 20 minutes. 4. Stir-fry the besan for 30 seconds and saute the chicken cubes for 2 minutes till half-cooked. 5. Add breadcrumbs and mix well. 7. 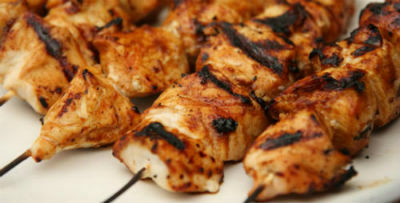 Skewer the chicken cubes and roast till cooked in an oven or tandoor. 8. Brush with the egg yolks and roast again till the coating turns golden brown. 9. Remove and serve hot with onion rings. Feel free to comment or share your thoughts on this Murg Banno Kebab Recipe from Awesome Cuisine.